"Currently I’m working on a hunting dog scene with my hero ‘Scotchie’. He’s an eleven year old English Setter with grouse hunting in his blood. He was born with a loving soul, is a master manipulator when it comes to wanting something, and a natural born healer to anyone needing TLC. It’s amazing how he can be so tenacious when on the scent of a bird and then be such a sweet animal back home. He’s one of a kind, an all around ‘vocal’ character. We’re thankful to be part of his family. The background of the painting is a composite of reference photographs I shot in Pennsylvanian woodlands. The grouse were researched by accompanying an avid outdoorsman during his grouse hunts, studying grouse mounted by taxidermists, and perusing books by Frank Woolner, Ned Smith and Gordon Gullion." 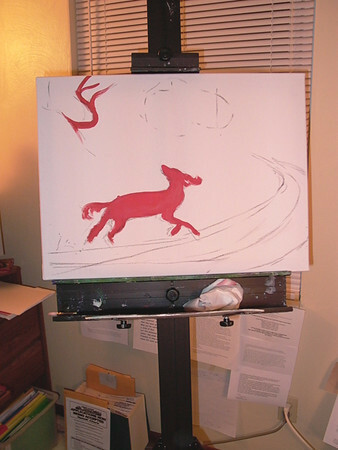 I like to do a quick underpainting to nail down my positioning and flow of the painting. It can also help to unify my colors and get my head deeper into the piece. As I work the simple color across the canvas, my mind is whirling, I'm able to feel if there's an area that will need additional interest added and become closer and closer to my subject.